Click on the video to pause/stop it from playing. 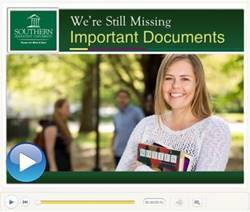 The most common source of college loan funds, Federal Direct Loans, are fixed-rate, low-interest loans available to students attending Southern at least half time (6 credit hours) and enrolled in a program that leads to a degree or certificate. To apply for a Direct Loan, you must first complete and submit the Free Application for Federal Student Aid (FAFSA). The information from your FAFSA will determine how much student aid you are eligible to receive. Direct Loans are generally included as part of your financial aid package . Subsidized Stafford loans are need-based. The government pays the interest on these loans while you are attending college, during a six-month grace period immediately preceding repayment, and during any authorized deferments. Unsubsidized Stafford loans are not need-based. You are responsible for all of the interest that accrues on the loan. Direct Unsubsidized Loans are available to undergraduate and graduate students; there is no requirement to demonstrate financial need. Step 1: Complete the FAFSA. Once you have received your award letter and accepted the Stafford loans, you may move to step 2. Step 2: Complete Entrance Counseling. The first time you take out a loan, you’ll need to complete Stafford entrance counseling before your loan proceeds can be released. Step 3: Complete Master Promissory Note. Complete the master promissory note to finalize the loan. Step 4: Upon graduation or separation from the school, you will be required to complete an Exit Counseling. More on exit counseling at the bottom of this page. Who is it for? Parents of students who are enrolled for 6 or more credit hours. How much can be borrowed? Parents may borrow as much as the cost of attendance minus other financial aid. Can the loan be deferred? If needed, repayment can be deferred until the student is no longer enrolled for at least 6 credit hours. Is approval guaranteed? Because this loan is based on credit score, not all parents will be approved. What happens if they are denied? If your parent is denied the PLUS loan, you become eligible for an additional amount in the Stafford Loan program. How do my parents apply? They can apply on the Direct PLUS website to begin the process. The FAFSA will apply you for both loans, and qualified students will see the loan as part of their financial aid award. For additional information please contact your student finance counselor once your FAFSA has been processed. Complete your PERKINS or Nursing Promissory Note here once you have been awarded. Private / Alternative loans are available to meet educational expenses when federal, private, and personal resources have been exhausted. Applications can be completed over the phone or online. Eligibility is determined in 10 or 15 minutes. Interest rates and eligibility requirements vary with each lender. Payments, including interest, can be deferred while the student is enrolled at least half time (6 credit hours). We do not endorse any particular private lender. We recommend you search the web for a suitable student loan provider that meets your needs. Exit Counseling is required when you graduate, leave school, or drop below half-time enrollment. Exit Counseling provides important information you need to prepare to repay your federal student loan(s). Exit Counseling MUST be completed for each school at the termination of your enrollment period or when you "leave"; even if you are transferring to another school. Select "Exit Counseling" under "Choose Counseling Type"
You will need the following information to complete exit counseling: your driver license number, the name, addresses and phone numbers for three references (one relative and two not related to you), and contact information, if available, for your employer or expected employer. Loans you took while attending other schools are included on this report also. You may also click on the “number” for each loan to view lender contact information. If you have further questions, you may also call the Department of Education at 1.800.557.7394. We recommend that you remain with your current lender if you are considering consolidating your loans. INSTITUTIONAL, PERKINS, and NURSING LOANS exit counseling is done through ECSI. Go to https://heartland.ecsi.net/ and click on Sign in or Register button at the top of the page. After signing in*, click on the School’s name and then click on the View Account button. Your exit counseling will be listed under the documents tab. *NOTE: After you have successfully created a new profile and/or signed in, you may need to connect your account to your profile. To do so, click on the Connect an Account button. When connecting your account, you will be asked to provide your Heartland Key (Account Number). The account number is a 17 character alphanumeric number (including a hyphen). A sample account number is 01122-12345678912. You can also search for your account number using your first name, last name, Social Security Number and zip code. Please remember that you will need to complete exit counseling for each type of loan you have (Federal, Perkins, Nursing and/or SAU Institutional).